WIN with DryNaps and Beautyzone! Home » Competitions » WIN with DryNaps and Beautyzone! Get ready to WIN diapers for a year! 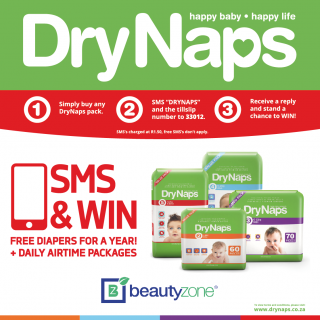 Yes that’s right DryNaps along with Beautyzone bring you another Diapers for a Year competition! Get to a selected Beautyzone store and purchase any DryNaps pack to stand a chance to WIN the grand prize DryNaps diapers for a year as well as daily airtime packages up for grabs. 1. Buy any DryNaps pack from a participating Beautyzone store. 2. SMS the word “Drynaps” and your till slip number to 33012. 3. You’ll automatically be entered to the WIN DIAPERS FOR A YEAR Beautyzone comp. The promotion is open to persons not affiliated to DryNaps or the Promoter of the competition who purchase any DryNaps pack and enter in South Africa ONLY. Winners will receive a grand prize of DryNaps diapers for a year and there are also daily airtime packages up for grabs. SMS’s charged at R1,50. Free SMS’s don’t apply. Find full Terms and Conditions here. Happy entering!